Skullsworn is a story about the Annurian Empire's most sacred league of assassins, a group of men and women dedicated to the God of Death . . . except it's really a story that's more about life than death. Brian Staveley's newest addition is everything readers could ask for, a worthy addition to a familiar world, and a stunning prequel that actually lives up to the original trilogy's legacy. What's more, in addition to fleshing out the story of Pyrre, it also introduces a small cast of new characters, any one of whom I'd be happy to read more about. In fact, I'd go so far as to declare Ela to be one of the best characters he's ever written. Skullsworn is a story about the final trial of Pyrre Lakatur, a sacred charge to kill ten people in ten days, including someone she loves . . . except it's really a story that's more about learning to live than kill. A story of personal conflicts, this is (quite naturally) a story of relationships. There's Pyrre and her quest for love with Ruc Lan Lac, a rekindling an old friendship, old lusts, and old secrets. It's a complex relationship, an affair that began just as it's destined to end - in violence. There's also Kossal and Ela, priest and priestess of Ananshael, Witnesses to Pyrre's trial, and dueling lovers who dance around one another as well as they do those who they aim to kill. Finally, there's Chua, an old woman caught between families and faiths, as doomed as she is by the death of her husband as she is tied to the delta because of him. Skullsworn is a story about a long-prophesized rebellion, a religious-and-civil uprising against a land's conquerors and oppressors . . . except it's all based on deliberate lies and tragic misunderstandings. Where the Chronicle of the Unhewn Throne was an epic fantasy, this is more a pulp adventure tale, complete with daring escapes, killer snakes, killers spiders, killer crocs, and . . . well, killers. It's a violent, action-packed story, but it's also a rather intimate tale, with its focus on love and death playing well against the sarcasm, dark humor, and razor-edged pillow talk. It's a story of layers, where every scene having a dual meaning, with what's said and what's done not always matching up in the way you'd expect. For a story that's wading towards a foregone conclusion, Staveley still manages to keep the reader in suspense, even as he engages our emotions along the way. Skullsworn is an attempt to flesh out the world of the Chronicle of the Unhewn Throne, an attempt to provide backstory for one of its most memorable characters . . . except . . . well, there's no exception here. Whether you're already a fan or a newcomer to the world of Brian Staveley, this is a story that's guaranteed to please. It works as well as a standalone story as it does a prequel, expanding the world and the mythology, without spoiling anything to come. 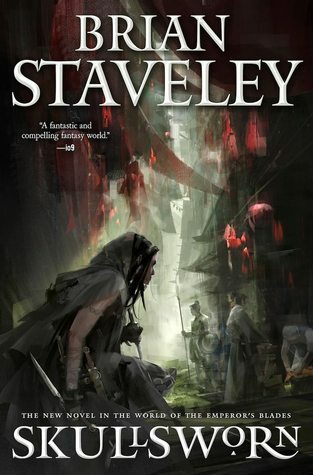 Staveley has already proven himself to be a master of world-building, character development, and sheer storytelling, and what he's done with Pyrre (and all the rest) just adds to that legacy. I like that short page count. I have thought about giving Staveley another try despite not liking his debut because he got so darn popular. A prequel may be where to do so. It's a good entry point into his world. Much lighter on the overall mythology/history than the trilogy - a solid standalone fantasy in a non-traditional setting. Getting ready to start this one! Very excited to read! Awesome review as always. Can't wait to pick it up. Oh my goodness, I can't wait! I loved Pyrre from the trilogy so this is going to be awesome!